Philadelphia producer/DJ, Dev79, has been banging it out as OG of the underground scene. He effortlessly weaves elements of grime, garage, rap and juke, among a plethora of other styles, with Philly’s cultural and musical history, into a tapestry of urban bass music that he (along with compatriot Starkey) have dubbed “Street Bass.” Through his original productions, remixes and collaborations, Dev79 always takes you on a daring ride of emotions and flavors, that will urge you to let your body take control. 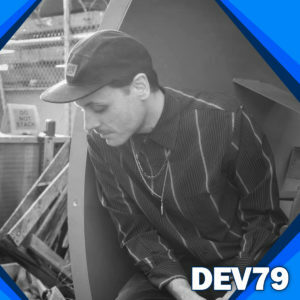 With his riotous DJ sets, Dev79 has kept dance floors sweaty across North America with his deep selection of bass heavy urban music, and has shared the stage alongside acts such as Eprom, Skepta, DJ Shiftee, AC Slater, Plastician, Deletion 3030, Mayhem and G Jones. Dev79 and Starkey are the masterminds behind the Seclusiasis empire, as well as Slit Jockey Records with partner El Carnicero. These successful and acclaimed labels have released artists such as Kastle, Stagga, Trim, Aquadrop, Todd Edwards, J-Sweet, BD1982, Warrior Queen, Mr. Mitch and ill-esha.